Is Your Organization Ready for the Cloud? Which Approach is Right for You? As the cloud value proposition becomes more apparent to enterprises, the focus shifts to implementation. This webinar unravels the benefits, tradeoffs and misconceptions associated with cloud computing, equipping IT executives and enterprise decision makers with a framework for evaluating their current IT infrastructure and making more informed decisions about how to best leverage the cloud. We’ll frame the debate between the public and private cloud, expanding the definition of “hybrid” to include a “portfolio” approach to XaaS—in which CIOs and CTOs allocate workloads, applications and data across a variety of outsourced solutions to truly right-size and optimize IT. As chief architect of Latisys’ national data center footprint and services platform, Christian Teeft is uniquely positioned to unpack the key factors that any enterprise must consider when forming and executing their cloud and XaaS strategy—including high availability computing and storage requirements, security and compliance demands, price sensitivity, as well as expected scalability needs. 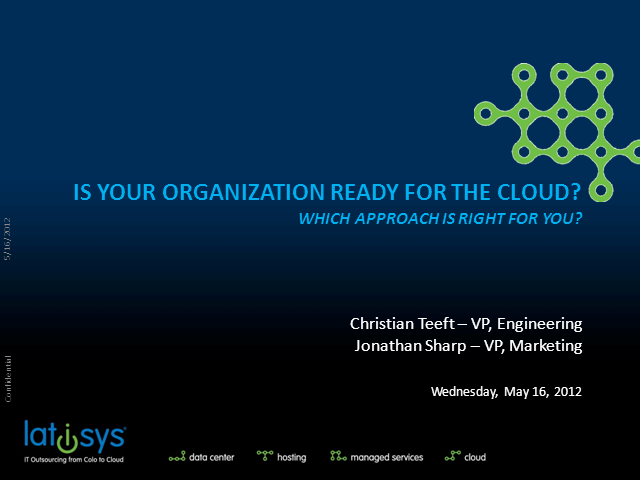 Title: Is Your Organization Ready for the Cloud? Which Approach is Right for You?